Your goals are clear, you’ve put all the pieces together to make things happen as you planned and yet things just aren’t going how you’d like – you may even be wondering whether you’re on a loser or going down a dead-end-road! It’s a position we all find ourselves in at some point or other. Often it’s a small change to what you’ve been doing — a change which suddenly turns everything around — a change that makes the difference between success or failure … a profit or a loss! Making that small change is often not as evident as it seems as we get so immersed in the “now” that we can overlook factors which can make a difference. It’s a problem which affects everyone, even big companies. In fact, I’ve personally found myself in that situation several times. Smart operators resolve this by calling for external input – for companies, it may be a consultant or an infusion of new blood (staff), whereas many individuals seek out mentors to guide them onto the next level. You don’t have to go down this path: often the solution is one which involves you alone — you just have to know what to look for! 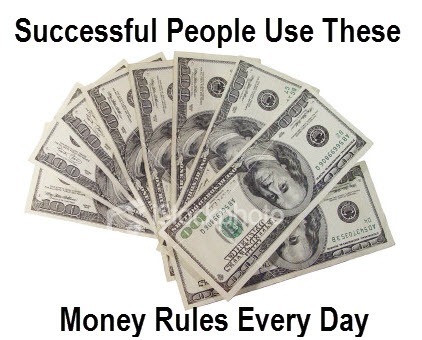 No matter what changes you make, they MUST involve one or more Golden Money Rules, the very “rules” which thousands use every day in all their money-making decisions. We call these Rules “golden” — because they consistently deliver results. I’ve had the privilege to have worked and made friends with many very successful people over the past 20 years and, without exception, everyone of them practices these Rules. To these people, these Rules are intuitive – you could call them a “habit”! To achieve the same success, you need to be proficient in your application of these Rules. If you don’t apply them, even your best laid plans / goals can come unstuck! You have to make them “intuitive” as well! Being proficient in all these areas is not as straight forward as it appears! If it were, then you’d already be raking in millions of dollars every year … and so would the majority of people you know.